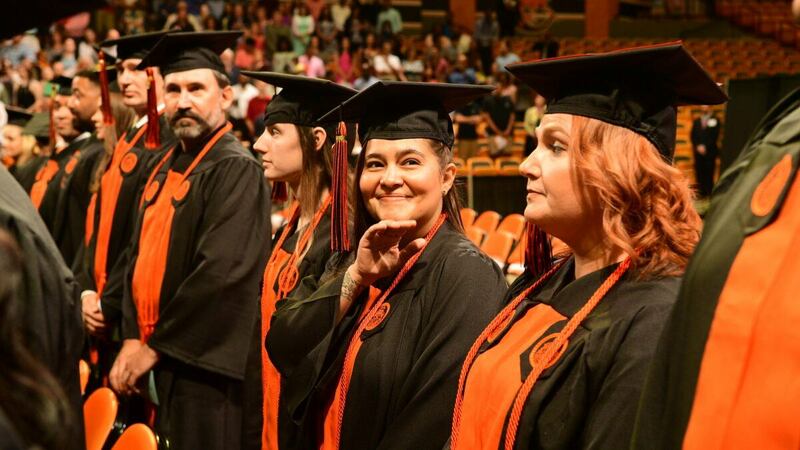 When the candidates took their seats at the Adult & Online Education commencement ceremony Saturday, they were greeted with an unusual message from the Dean Beth Rubin: the cries of children in the audience would not be considered an annoyance at this ceremony. Instead, said Rubin, students and their guests should smile at the sound and be grateful that so many graduates’ families could watch their parents achieve their goals. As adult learners, many of Saturday’s graduates have pursued higher education while raising children, working full time or serving in the military. 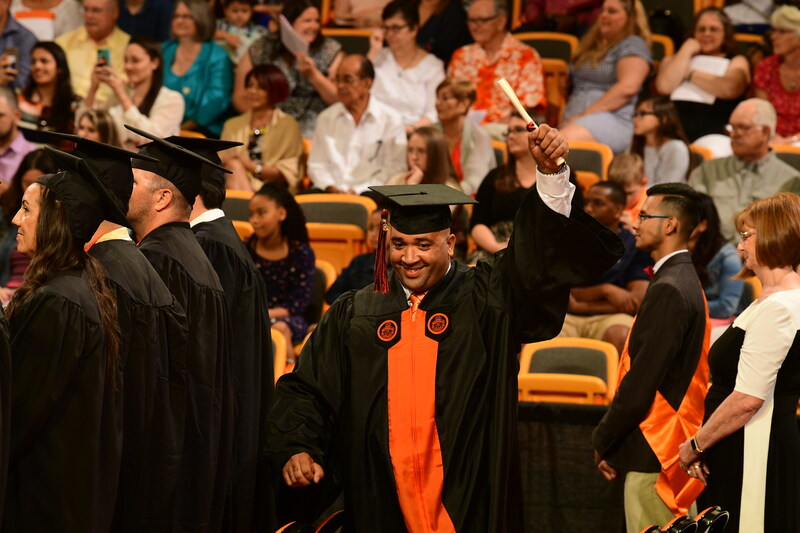 The ability to seek out knowledge and self-improvement in the face of many obstacles was one of commencement speaker Bob De Contreras’ “Seven Secrets to Success.” A managing partner at Research Triangle Business Advisors, De Contreras advised the graduates be change-makers. Non-traditional students certainly face their fair share of challenges. President J. Bradley Creed expressed his appreciation for the graduates’ hard work and dedication as he remembered watching his own mother graduate from college when he was 16 years old. 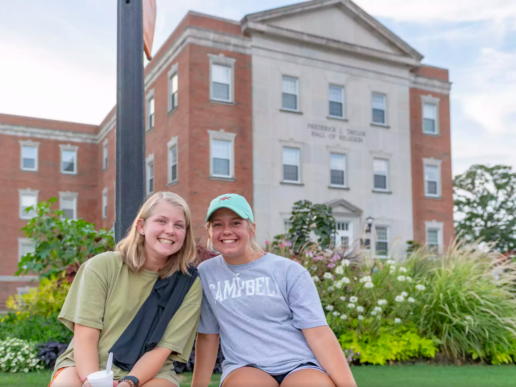 Online Education students came to main campus from all across the country, but Campbell’s Fort Bragg, Pope Field, Camp Lejeune and New River campus students made up most of the graduation candidates. Only a handful were left seated when Rubin asked active duty and veteran military to stand for recognition. Marine Corps veteran Rolonda McCray graduated from the Camp Lejeune campus with double majors in Business Administration and Accounting, all while working full time. 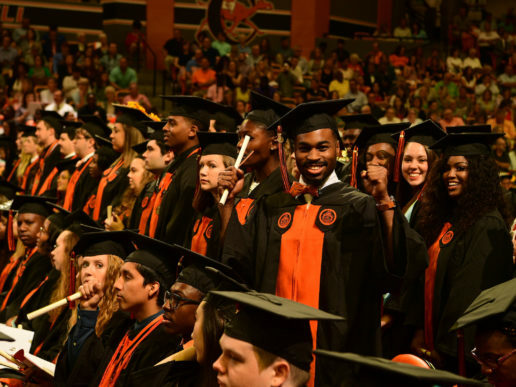 Before addressing her fellow students at the ceremony, she thanked the Campbell faculty and staff who helped her reach her goal. 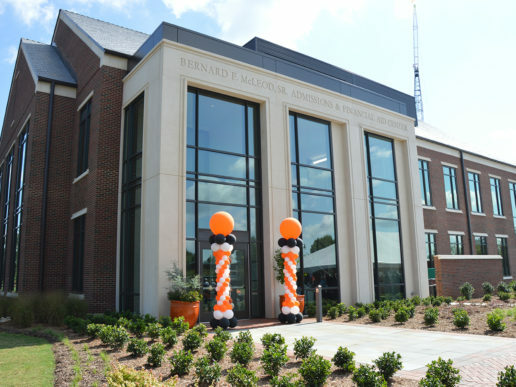 For many online and branch campus students, today’s ceremony was their first time visiting Buies Creek. But for Mildred Soto Gutierrez, today marked her first time at a graduation ceremony, period. Her high school didn’t hold a ceremony, but the liberal arts major was thrilled to attend her first official commencement as a graduate. Although she was an Online Education student, Donna Wyckoff is no stranger to main campus. The ITS Security major worked at Campbell for 16 years before starting her degree program. She started her online courses to improve her job in computing services. Eight years later, Wyckoff is excited to be moving forward with her career.